We've had more than 9 weeks of summer vacation. By that, I mean that's how long my 10-year old has been out of school. That sounds like a long time but it's gone by so fast. We have just one week left to savor the ease of summer before heading back to school and all that it involves. I've been thinking that the little one and I haven't been cooking in the kitchen together enough so I thought we'd make some lunch. These are pizza pinwheels, a fun and easy twist on pizza. I saw them on The Kitchn and they looked and sounded like just the thing to whip up with my fella because he loves pizza so there's basically no better thing to cook with him! They also reminded me of some very similar - and very delicious - pinwheels we used to get from a pizzeria in Brooklyn where we lived at the time. Of course, these cheesy pinwheels are stuffed with pepperoni. As much as I'd love to get creative with toppings on homemade pizza, my son will vote for pepperoni every single time so that's what we'll stick with. Thinking about those pinwheels we used to get at Nino's Pizzeria in Brooklyn, I remembered theirs' were coated in sesame seeds (which somehow seemed to make them extra good) so I took that inspiration and rolled a few of our pinwheels in sesame seeds. They add a little texture and I'm a big fan of it. These pizza pinwheels were incredibly easy to put together, thanks to plenty of shortcuts with store-bought ingredients. We just got home from vacation (plenty of beach and pool time, as well as delicious Cuban food, in Miami Beach) and as usual, I find myself in a little bit of a cooking rampage when I get back on home turf. That said, I am definitely looking for quick meals since there's always so much to do after being away even for a little while. So we used store-bought pizza dough and fixings and we just had fun pressing, rolling, and assembling. Since my son still has a rather short attention span in the kitchen, it's just the right amount of kitchen action for him. My husband was our photographer, cheerleader, and eager taste-tester. It was a fun time! While you could certainly use homemade pizza dough, I simply picked up a ball of dough from Trader Joe's. Next time, I'd love to try these with a round of whole wheat pizza dough. Start by pressing and rolling the dough into about a 10x16 inch rectangle. Spread sauce evenly around, leaving an inch of space at the top. Follow that with shredded mozzarella and sliced pepperoni. Here's where you could get creative and customize. Why not use pesto instead of tomato sauce, and as for toppings/fillings, you can really go with whatever you like. I happily followed my little guy's lead with plenty of pepperoni! When I was a kid, all I ever wanted was pepperoni pizza too so I can't blame him. Once the toppings have been added, roll the dough from the side closest to you up towards the top where that empty border is. Pinch the seams shut. Then slice the roll into 12 pieces. I first slice the log in half, and I actually froze half of it for another day (I plan to defrost then slice and bake; you could also slice, wrap, and freeze the rolls individually and then be able to bake as many or as few as you need later on). If you're baking all the pinwheels right away, slice into the 12 pieces and lay it cut-side up onto lined baking sheets. You can either slide them right into a 400 degree oven (in which case they should have a chewier, more pizza-like texture) or let the pinwheels sit for 30-45 minutes for a puffier, more bread-like texture. We were a bit short on time so I let ours sit for about 15-20 minutes before baking. If you're interested in adding the sesame seeds, simply place some toasted sesame seeds in a bowl and roll the outside of the pinwheels lightly in it. I definitely like the sesame seed factor. In less than 15 minutes (in which time you can clean your countertop and set the table for lunch), the pinwheels will be puffed and oozing over with cheese. Just let it cool a couple of minutes before serving and digging in! My son had fun helping to make lunch, and I'm glad he still doesn't mind it when I make him hold up a tray of something we made together so we can take photos of him! All the while, he can't wait to eat! Our half batch of pinwheels disappeared quickly and I can tell you they were most definitely kid-approved. Collaborating in the kitchen sure is fun and honestly, everything does seem to taste better when it's a group effort! If planning to bake pinwheels right away, preheat oven to 400 degrees. Line a baking sheet (you might need two) with parchment paper or silicon mat. Dust counter or work area with flour. Place pizza dough on top and pat it into a rectangle. Using a rolling pin lightly dusted with flour, roll the dough into a rectangle about 9 to 10 inches tall and 15 to 16 inches wide. If the dough starts to spring back as you work with it, let sit for a few minutes and then continue. Spread tomato sauce evenly on top of the dough, leaving about a 1-inch clean border at the top. Sprinkle mozzarella cheese evenly on top, then scatter pepperoni over it. Beginning at the long end nearest you, roll the dough up towards the top. Pinch the dough close along the seam. Using a sharp knife, slice the roll into 12 pieces. If coating with sesame seeds, place the seeds in a shallow bowl. 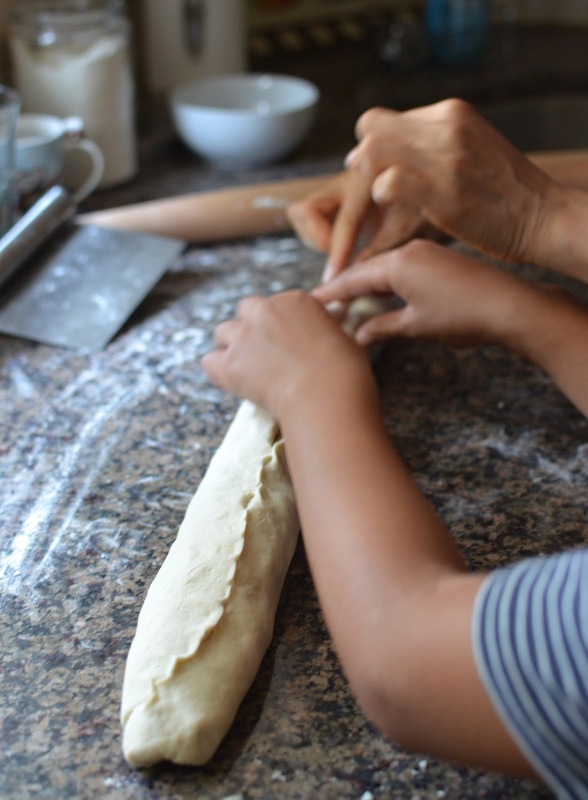 Carefully move each roll (using the flat of your knife or a pastry cutter to help you) and lay the side of the roll into the sesame seeds and roll lightly around. Place onto the baking sheet, cut-side up, spacing rolls a few inches apart. Gently press and tighten the rolls, and tuck any toppings back into place, as necessary. You can bake the pinwheels immediately or let sit for 30 to 45 minutes for a puffier, more bread-like texture. Bake for 12-15 minutes, until pinwheels have puffed, are oozing with cheese, and look golden on top. Let sit for a couple of minutes before serving. Leftovers can be stored in an airtight container, in the refrigerator, and reheated in the oven, or in the microwave for 30-60 seconds. You could also freeze pinwheels unbaked (cut or uncut), wrapped tightly in a freezer bag or container. Defrost and bake as directed. Very fun and easy - thanks! This is a wonderful post! I love that you teach your son to be successful in the kitchen. He will grow up with kitchen confidence and not have to rely on ready made foods. So cool your husband helped too. These pizza pinwheels look absolutely delicious! What little delicious bites! I would love a couple of them for my soup. Thanks, Angie. Always ready for soup myself. With the store-bought ingredients, it was such a breeze and very stress-free. It was fun and you're right about pepperoni and extra cheese. I remember when I was growing up, people always ordered extra cheese on their pizza but that doesn't seem to be as common anymore. Maybe it's more loaded down these days as it is? Hi Monica, what a wonderful cooking project for you and your son, and yes I agree this summer is going by at a crazy speed. Take care! These are the best moments of life Monica. Cooking with kids gives such immense satisfaction right?! I'm sure your little one enjoyed every bit of the process. Those pinwheels look amazing, I love making those too. I cannot believe vacation went by that quick too, now it's a very silent home. All the best to your dear little one for his school year. It's true...I love the process and sharing experience! : ) I hope you guys are having a smooth transition. Fall is exciting...I'll just keep thinking positively like that. :) You take care now, Asha! I hope you had a wonderful time on vacation Monica!!! I keep meaning to make pinwheels - these are so much fun! Perfect for game day too! I feel the same way, summer went by so quickly. Hope you enjoy this last week with your son at home before he goes back to school. My son starts for the first time next week - eeek so nervous and excited at the same time. Hope you had a great time on your vacation! Love that you made pinwheels! So fun! They look fantastic! It was long but it went so quickly! We all agree, even the little man. Your little one starting school for the first time is so HUGE! I was a nervous wreck way back when...you definitely need to relax and take on a cool/happy attitude. I know you (and your son) will have no problems! I love this twist on pizza! So fun!! I love pizza, and making this into mini pinwheel is such a fabulous idea! Love the one coated with sesame seeds! These pinwheels look so delicious and fun to make!! A great portion size too. My kids would love them! Enjoy the last days of the holidays and I hope you found some gourmet treats on your trip to Miami?! Hi Jo! We had some wonderful Cuban food in Miami! That was really fun. And the fruit and seafood there are excellent also...we ate well and that makes it all the better! I have plenty of things stocked in the pantry for shortcuts! : ) Life-saver! Hope you had a great summer, Monica! Sounds like an amazing vacation! Time with family in the kitchen is time well spent. And look at the outcome! These are so cute and totally irresistible. I want to make some...actually eat them now! No worries! Thanks for swinging by and commenting when you do have a chance. I always appreciate it. You are too kind! I would swap a few pinwheels for a few slices of your beautiful neapolitan cake!! What a lovely alternative to a standard pizza, great idea! It's a fun little twist and good portion sizes. Thanks! Pizza pinwheel night is even more fun than pizza night! Love that you and your son made these together. I'm sure that made them extra tasty. I'm totally biased about anything cooked with the little guy, for sure! : ) Hope you've had a great summer, Joanne. Oh gorgeous look at these pinwheels! I just had lunch but I want to grab a few of these through the screen and pretend it's a reasonable afternoon snack! Thank you, Pamela! It was as fun to make as to eat. These look SO good! You really can't go wrong with pizza. What a fun thing to make with your son!